Results: Energy Resources utilized the Easylite energy management lighting system that reduced lighting energy consumption by 59% in classrooms, library and administrative areas. Through dimming and Daylight Harvesting we provided additional energy savings in this school by reducing the A/C load. The lighting system reduced lighting energy from over .9 to .4 watts per sq. ft. The school was installed with self contained ambient lighting controls for every classroom, library and office area. The ROI for this project was slightly over one year. 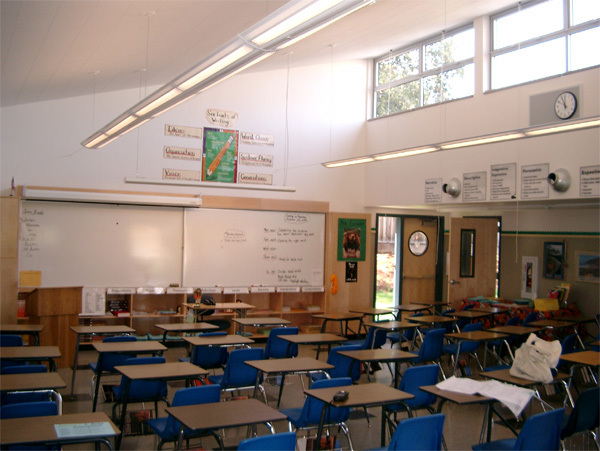 Project Review: The lighting system in this Los Altos, California School consists of Daylight Harvesters, dimming ballasts and a low voltage cable system. Each row of indirect/direct pendent fixtures is controlled by one Daylight Harvester. The Harvesters in each room independently balance the light output; therefore providing the proper light level in every area of each room. There are 30 classrooms each one approximately 900 sq. ft. The Daylighting Control System maintains a minimum of 40-45 FC. The windows in the school face North and East with each classroom enjoying approximately 100-500 sq. ft. of glazing. There are two to four fixture rows in each classroom, from 20-36 feet long. Each four foot section has two, 32 watt T8 lamps. The ceiling tiles are white, the walls are painted white and the floors are light vinyl.